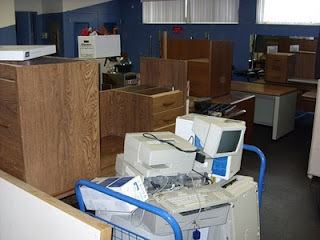 Rambling Moose: How about some desks and office equipment? So, can we sell you a few good desks? When I was walking through the old City Hall in Wilton Manors, I stepped into this room first. It was the old Police Gym and at this point ended up being the repository for old office equipment. Here you see the big pile of desks that were there for your choosing that created an interesting maze. I managed to get through there unscathed - no knees damaged when I walked through the piles of desks, stacks of weights, tottering towers of old TVs and clumps of computers. Still in all, what is leftover will be sold as is by the Historical Society of Wilton Manors. The money goes for a good cause, and you can pick up some furniture if you need it. I will be there having a look around and will be manning the Chairs so if you are nearby say where you heard about it. If you don't see me, there are some truly wonderful people involved with the Historical Society who have some amazing story about this wonderful and quirky slice of paradise. Trust me the Sale is worth it just to meet Diane, Ben, Paul, Mary and some of the others. I count myself very lucky to share some time with them every chance I get. 8AM to 2PM April 10th. Saturday.